Highlights from this year’s festival that featured some new names and old favorites. Tradition. That word kept running through my mind as I walked through Maymont last weekend taking in the live music on two stages at The Richmond Jazz Festival. I was lucky to see big names and practitioners of various traditions. Some bands (Jeff Lorber Fusion, Norman Brown, Najee, George Benson, and many others) presented the “new” in the scope of jazz, and a small group of others represented their ancestors. People like John Pizzarelli and saxophonist Ravi Coltrane. The “vintage” sounds of Pizzarelli’s quartet stood in stark contrast to the other, more contemporary music presented at the festival taken as a whole. Pizzarelli is a virtuoso guitarist, and the son of one of the most famous guitarists in jazz, Bucky Pizzarelli. 1 Like his guitar playing, John’s singing is equally full of life. Even playful at times. The arrangements of Duke Ellington standards followed by new arrangements (or more-accurately, “mash-ups,” to steal a modern idea from DJs) off his latest record Double Exposure, smartly blended jazz tradition with popular music by Lennon/McCartney, The Allman Brothers, and even Tom Waits. Behind Pizzarelli, pianist Larry Fuller put serious muscle into the keys, with a vocabulary gleaned from one of the most iconic jazz pianists of all time, the legendary Oscar Peterson. Fuller, having apprenticed under bassist Ray Brown for years, has an immediate connection to that hard driving, swinging piano tradition Peterson created. Brown was Peterson’s longest-running collaborator in the pianist’s trio. In Fuller, one can hear that tradition reverently on display, and the feeling left me (a fellow piano player) mesmerized. Another musician with a famous father, Ravi Coltrane, presented, not his working band for the past decade or longer, but a pick-up band featuring younger talent. There is a deeper story here about Ravi’s father, John Coltrane, who created a modern concept of the tenor saxophone and formed a working band that became one of the leading bands of the 1960s. John Coltrane succumbed to liver cancer in 1967 at 40 before some of the jazz world developed new, more diffuse pallets fused with rock drumming and electronics. Ravi was only a toddler when his father died, and during those early years, John was constantly away from home on tour. His relationship to his famous dad, although unique as every familial relationship is, can be deluded by merely framing it as someone Ravi grew up knowing. In another way, it might seem that his relationship to John is closer to that of an archivist with a priceless collection to oversee. Ravi has physical possessions, physical handing-down of the jazz tradition, of his father’s that no one else has: notebooks of theoretical structures that he had yet to develop on stage, philosophical musings, and home recordings on reel-to-reel tape. So when Ravi comes to a Jazz Festival where he presents a group of likeminded young artists, and much of the scope of jazz presented at the entire festival is marketed as “contemporary” or “smooth” or even “quiet storm” (what does that mean, exactly? ), there are traditions that stare him in the face, and traditions that he knows he is a steward of for better or worse. One has to wonder how he takes it all in. It took him a few minutes to get started, as he set up the stage with the crew (even pushing the grand piano into the position that he wanted). He paced, and spoke with each person he saw, and smiled. After being introduced, he and his band started into a swirling, up-tempo version of the 1942 Jerome Kern standard “I’m Old Fashioned.” Enough said. As clever a joke as that selection was, it also speaks volumes about where he sees himself in the context of bands like George Benson’s, or Najee’s, or many others at the festival. Did the audience pick up on the commentary if Coltrane meant it as such? Who knows? But the set presented by this group had all the staples of a great modern band like his father’s was back in the 60s, and they brought a searching, fearless vibe to the stage. The rapport between the young rhythm section (pianist Glenn Zaleski, bassist Dezron Douglas, and drummer Nate Smith) seemed to give each song a sizzle, and maybe this is what Coltrane felt he missed with the more routinized working group he just broke up. Other songs in the set were decided by Coltrane calling the tunes to his bandmates after a few seconds of running options and then confirming they were familiar with them. That sort of off-the-cuff spirit did not show up in the other groups presented (even Pizzarelli’s). Surprises came in each improvised arrangement, with a version of Thelonious Monk’s “Epistrophy” that began only with sax and Smith’s powered drumming. The entire set was gripping, and the band held court. They closed with Ravi’s father’s ultra-modern chest-thumping composition “Giant Steps” (composed way back in 1957) which was another nod to his stewardship of the tradition. Clearly, it’s still fresh to Ravi. Catching bits-and-pieces of the Jeff Lorber Fusion band, it was obvious to me that there is another element even to the way “contemporary” jazz comes together on stage. Lorber moved back and forth between Yamaha keyboards, switching patches, altering filters, adjusting effects and volume levels. He plays brilliant, hard edged piano, but maybe not with the same kind of might of Larry Fuller. Still it was fun to see the great bassist from the Yellowjackets, Jimmy Haslip, and saxophonist Eric Marienthal, whose active playing in many groups under the “Smooth Jazz” marketing bubble is something that made that tradition what it is today. Featured before the Sunday night headliners The Whispers on the “Dominion” stage, guitarist Norman Brown played his grooving guitar riffs for an elated and equally grooving audience (this is the first time I’ve seen so many people dancing at the foot of the stage at a jazz festival). The drummer rocked propulsive beats, and the keyboardists laid down pads of futuristic, metallic synth brass from an arsenal of Korg Triton keyboards. All these space-ship-esque keyboards made the stage look more like a set from the ’80s movie Flight of the Navigator. Still, the crowd enjoyed the offering from Brown’s tight band, and he pleased them with a medley of selections from his gold album After the Storm. On the “Virginia Is for Lovers” stage on Sunday evening, NEA Jazz Master George Benson, with ten Grammy Awards under his belt, also made the audience get out of their lawn chairs and dance. The music alternated from R&B to disco, and even a teaser of some swinging blues. Benson’s singing took a more central role to his guitar. After an opener of his most famous tune “Breezin'” that seemed to get started without ceremony, he sang “Moody’s Mood for Love” and the Quincy Jones ballad “Everything Must Change” from Jones’ 1974 album Body Heat. Having spent more time listening to his 1966 album It’s Uptown than his colossal multi-platinum record Breezin‘ from a decade later, I was surprised to hear him take the focus off the guitar, especially since his latest album released only last year is titled Guitar Man. Maybe it’s a choice he makes for his life shows, since the audience might not want to hear lots of long solos. On this performance at least, his soloing chops were nothing like what they were on It’s Uptown or this gem on YouTube. Still, Benson knows his audience very well, and they know him (many audience members standing around me sang along during “Everything Must Change”). He is an icon not only of jazz, but contemporary R&B culled from the 1970s and 80s. 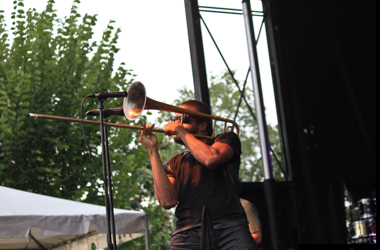 Overall, the Richmond Jazz Festival, with two stages and merchants sandwiched in between, felt well-executed. The idea of bringing the radio-friendly brand of “instrumental pop” or “contemporary jazz” or “smooth jazz” onto the stage to see what the artists like to do when they stretch is admittedly intriguing, but also left me disappointed at times (Najee’s five minutes spent circular breathing while holding a long tone on his soprano saxophone got the crowd going, but, sadly, didn’t impress me). However, to be able to hear a live band is always going to be a thrill in comparison to something on the radio, no matter what era of jazz these artists might offer. Unfortunately, I missed Saturday attractions like Stanely Clarke, Trombone Shorty, and the headliner India Arie, but thankfully these artists all will make their way again through Richmond soon in other contexts, be they “traditional,” “pop,” “jazz,” or some other word.